The first teaser trailer for Focus Features' Sinister 2 is upon us. The spooky short clip debuted yesterday at WonderCon 2015 and appears to promise some solid jump-scares and plenty of eerie feelings. Check it out below. Sinister 2 debuted at Blumhouse Productions' presentation at WonderCon, providing fans their first glimpse at the upcoming horror sequel. 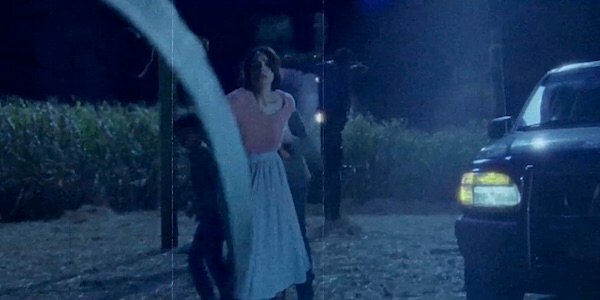 While there isn't much to go on from the short 16-second teaser, it is certainly enough to get fans of the first film excited and, more importantly, pretty spooked. There are a few standout frames, one of which is likely just a passing moment in the film, that promise to deliver chills, provided they're done right. For one, there's the creepy children standing amongst the corn. Yes, we've seen these images in a dozen or so horror movies over the years and yes (again, when done properly) they can be extremely effective at scaring the heck out of you. That's why they're used over and over and over again. Then there's the old found footage imagery that appears to show some of the history of the supernatural occurrences that'll likely be plaguing the family who's just moved into the house of their dreams-turned-house of their worst nightmares. That's a mighty large blade, if I don't say so myself. And from the looks of the background, there's the promise of victims being bound to life-sized crosses. And are those the starts of flames starting to burn the person currently hanging on that cross? Regardless, it doesn't look like anybody's ideal resting place. Sinister 2 picks up after the events of the first film from 2012 and follows a mother named Courtney, played by the wonderful Shannyn Sossamon (The Rules of Attraction, The Day), and her two 9-year-old twin sons (played by real-life twins Dartanian and Robert Daniel Sloan) as they move into a rural home that turns out to be haunted by the sinister spirit Buhguul. The low-budget horror pic, which won't include any faces on the level of Ethan Hawke or Vincent D'Onofrio (both of whom were in the first installment), was written by the original film's writers Scott Derrickson and C. Robert Cargill, along with Neal Parks (My Amityville Horror) and directed by Ciaran Foy (Citadel). It hits theaters August 21, 2015.